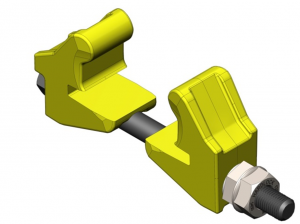 Enhanced defect protection clamp achieves Network Rail approval - Henry Williams Ltd. The clamps are available from supply from today and we would welcome your enquiry, see below for the approval cert. The clamp can be used on 109/110A/113A and UIC 54 & 60 rail sections. It must be noted that, as before, bolts cannot be reused if bent and both the bolt (057/054266) and the nut system (057/054267) are available to purchase as spares. The bolt and nuts are not interchangable with the old style of clamp and these clamps should be considered obsolete. The clamp is just part of our extensive range of fishplates and clamps approved for use on the railway including the 113A defect protection plate 057/054018 ideally suited for use with this clamp.